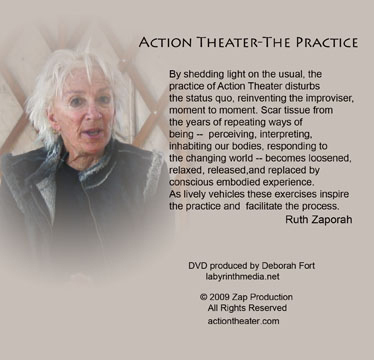 The long awaited DVD, Action Theater, The Practice, from fabulous filmaker Deborah Fort has arrived and now available. This 5.5 hour film offers 30 of the most essential exercises of the Action Theater practice. They are demonstrated by Senior Teachers along with many examples of open scores. There are also live performance clips of Ruth and other Action Theater improvisers. Not only can these revealing and informative episodes be viewed on their own, they can also be viewed along with Ruth's voice running along simultaneously, as she shares her clarity of understanding of improvisation, her observations and most essential, her pertinent teachings. For those of you who have practiced Action Theater, this film will continue to keep you on track, reminding you of the essentials, of what makes Action Theater what it is. For those of you who have only been practicing with Ruth's books, this film will demonstrate the true intention of the exercises. And for those of you who have taken trainings or practiced on your own but have never see how these practices inform performance, this film clearly demonstrates that. The film itself is a training. This along with the books can be your studio companions for years to come. Ruth's books alone can only take you, the practitioner, so far. This film, Action Theater, The Practice, is the practice, live. Ruth Zaporah is a New Mexico based performance artist, director and teacher. She is internationally known for her innovative work in the field of physical theater improvisation. This work is called Action Theater. Zaporah spends much of her time on tour, performing and leading trainings in Europe, Israel, Asia and the US. In 1994 she performed in theaters and refugee camps in Serbia and Croatia. In the spring 2000, she added Kosovo and Sarajevo to that itinerary. Zaporah is a two time fellowship recipient of the National Endowment for Choreography. In 1994 she was honored with a Sustained Achievement award by the San Francisco Bay Area Dance Association. She is currently a Cultural Envoy for the U.S. State Department. Ruth's articles on improvisation have been regularly published in Contact Quarterly, a magazine for new dance forms. Her book, ACTION THEATER: THE IMPROVISATION OF PRESENCE, published by North Atlantic Books, is in its fifth printing. 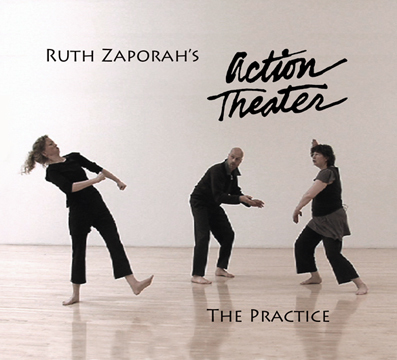 Action Theater™ is an improvisational physical theater training and performance method (created by Ruth Zaporah). The disciplined practice incorporates movement, vocalization, and speech. These exercises lead the physical actor toward strong, clear, spontaneous, and artful improvisations. The skills learned are appropriate for all actors whether they follow an improvisation or a script. The exercises of Action Theater™ isolate the components of action – time, space, shape, energy, emotion – so they can be examined, experienced, and altered in order to expand the expressive palette and the inner experience of the actor. The Action Theater exercises quiet the mind and clarify focus allowing for a thriving embodied imagination. Action Theater™ can also be a performance method where the experiencing of the body informs the content of the moment and offers a map, a way to proceed. through the spontaneous action of solo or group improvisations. Deborah Fort is an independent digital media artist who lives and works in Santa Fe, New Mexico. Her work ranges from documentary to experimental-interactive-installation. Deborah first saw Ruth perform in 1979 and never forgot it. Thirty years later, Ruth as both teacher and performer is still unforgettable. Among other projects, Deborah is currently working on a video portrait of Ruth.